A new application released for Android called Knock Lock, allows users to lock their devices by tapping on a designated area of their display. If you currently own an LG G2 or G Flex device, this app may not interest you, as your devices already are capable of such a function. However, not everyone owns an LG or the new HTC One (M8), which also features a function similar to this. Once installed from Google Play, and privileges have been granted to the app, users simply set up an area they would like to tap on. From there, all a user has to do is double tap on the area they selected and the device will lock itself. Unfortunately, the app does not allow for taps to turn the display on. Who knows, maybe an update could bring that feature, however, that functionality could be more on the hardware side of things. For anyone concerned about the app’s battery usage, the developer states that it should be below 0.1%. We recorded a brief demo video and have placed it below to give you an idea as to how the app works. 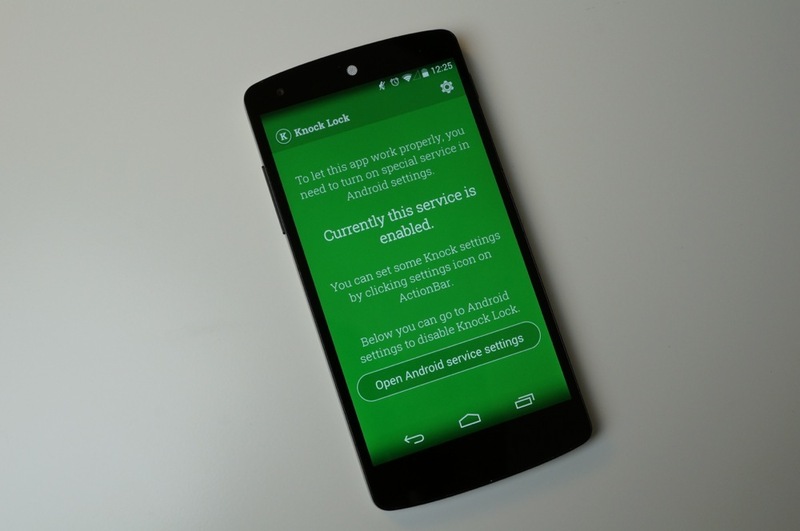 Knock Lock is completely free on Google Play, so go check it out.